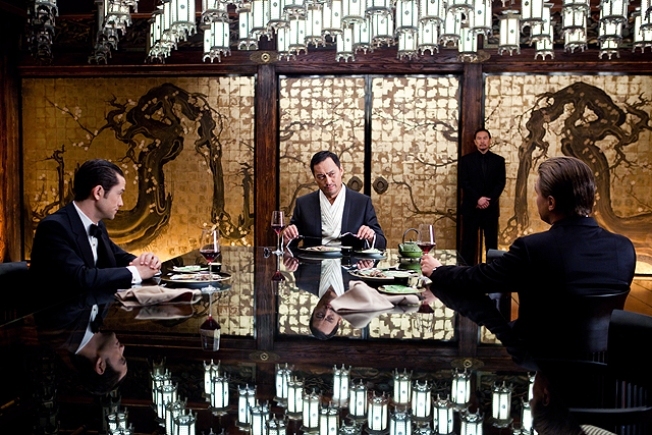 (L-r) JOSEPH GORDON-LEVITT as Arthur, KEN WATANABE as Saito and LEONARDO DiCAPRIO as Cobb in Warner Bros. Pictures� and Legendary Pictures� sci-fi action film �INCEPTION,� a Warner Bros. Pictures release. The mysterious "Inception" promises to be a film full of twists and turns – and director Christopher Nolan says the movie was inspired by the "James Bond" series. "The Bond influence on the film was very intentional because, for me, growing up with the Bond films - they've always stood for grand-scale action," he told BBC News. The director's films have ramped up their scope since his early work on "Memento" and "Insomnia," with "The Prestige" and the record-breaking "The Dark Knight" dazzling audiences – due in part, he said, to 007. "[Bond films have] stood for the promise of being taken to some place bigger than you could have imagined," Nolan said. "In dealing with the human mind and dreams, my mind naturally gravitates towards the Bond films as that sort of expression of cinematic potential. By the end of the film you feel that 'Inception' could go anywhere and do anything." The in-demand director added that he'd "love to do a Bond film," though the franchise's next installment, its 23rd, seems to be dead in the water – according to Ain't It Cool News, "all development" on the Sam Mendes-directed project has halted due to MGM Studio's reported financial difficulties. While a Nolan "Bond" picture would set fans' hearts racing, it's Batman that audiences are clamoring for him to return to – though he wouldn't commit to a third film in his reinvention of the Caped Crusader to the BBC. "I'm first going to be turning my attention to having a holiday, because I've just finished ['Inception'] and I need a couple of weeks off," he said. "And then I'm going to figure out what's next and what we'll be doing in that direction." However, Michael Caine, who appears in "Inception" and has played Bruce Wayne's butler, Alfred, in "The Dark Knight" and "Batman Begins," may have spilled the beans at the "Inception" world premiere in London. "I think they're going to do it in April. That's about as much as I know," he said on the red carpet on Thursday, hinting at a start date for the anticipated film's production.